Trick Or Treat Classic Slot Guide & Review - Casino Answers! 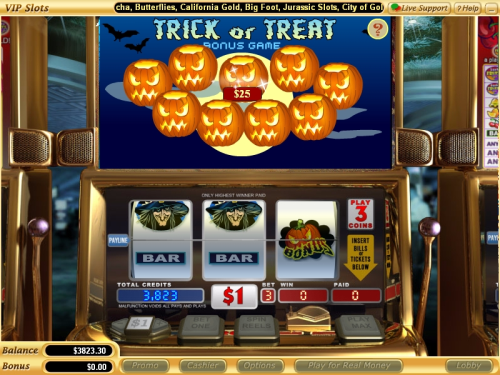 Trick or Treat (also known as Haunted Reels) is a 3-reel, 1-line classic slot machine developed by Vegas Technology, featuring a wild symbol, multipliers and a bonus game. You can play the Trick or Treat classic slot game at Bovada. 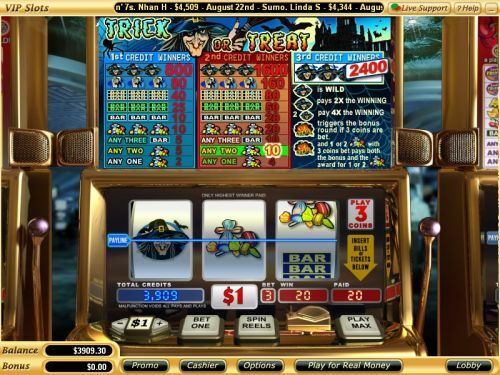 Bets on the Trick or Treat slot machine are $0.10, $0.25, $0.50, $1, $5 or $10. You can bet from 1-3 coins. Casino Answers recommends that you use “Play Max” to bet all 3 coins at all times on the Trick or Treat slot game to be eligible for its bonus game. Trick or Treat is a dime slot, so you can play as little as ten cents or up to $30 on a spin. Most players, whether casual slots players or high rollers will be happy with Trick or Treat’s betting range. To play the Trick or Treat online slot machine, use “Bet One” to select the number of coins you wish to play and hit the “Spin Reels” button. The highest paying symbol on the Trick or Treat classic slot is the Witch symbol. On a 3-coin maximum bet, 3 Witch symbols will pay out the 2400 coin top jackpot. The Witch symbol is wild and will substitute for all symbols in Trick or Treat except for the Jack-O-Lantern bonus symbol. When substituting in a winning combination, the Witch symbol will act as a 2X multiplier or a 4X multiplier when two symbols are used. The Witch symbol can come in handy when you play Trick or Treat at Bovada! There are 9 winning combinations on the Trick or Treat classic slot machine. The complete payout schedule is as follows (1/2/3 coin payouts in parenthesis): 1 Candy symbol (2/4/4), 2 Candy symbols (5/10/10), 3 of any Bar symbols (5/10/10), 3 Candy symbols (10/20/20), 3 Single Bar symbols (10/20/20), 3 Double Bar symbols (25/50/50), 3 Triple Bar symbols (40/80/80), 3 Tombstone symbols (80/160/160) and 3 Witch symbols (800/1600/2400). If you’re in the Halloween spirit, the Trick or Treat slot machine is just what you’re looking for. Some decent payouts and a bonus game means that Trick or Treat has very few tricks and a lot of treats! To play Trick or Treat, sign up and make a deposit today at Bovada! Are players from the United States able to play the Trick or Treat slot for real money? Players from the United States of America are welcome to play the Trick or Treat bonus slot at all Vegas Tech casinos, including Bovada. What is the most I can win on the Trick or Treat slot game? If you make a 3-coin maximum bet at the $10 coin value and hit 3 Witch symbols, you will win yourself a chilling $24,000! Is there a Trick or Treat Flash game that I can play for free? If you have a Macintosh or if you don’t want to or can’t download the casino software, you can play the Trick or Treat slot machine in your browser with no download required at Bovada. If you experience any difficulties with the Instant Play Flash software, make sure you have the latest version of Adobe Flash Player installed. If you want to read more Halloween slot game reviews, please read our list of Halloween slots. Trick or treat flash game, Where can I play a good Halloween classic slot? Where can I find the Haunted Reels classic slot game?